﻿ BoneFinder® | Bone shape analyses made easy! BoneFinder® has been used in a study on investigating bone shape both as a risk factor for and as a result of hip osteoarthritis. The results of this study will be presented in May 2019 at the 2019 Osteoarthritis Research Society International (OARSI) World Congress, Toronto, Canada. The abstract will be made available on the BoneFinder® website following the event. The Cephalometric BoneFinder® module is integrated in AudaxCeph, a cephalometric software analysis suite, allowing the automatic tracing of cephalometric landmarks within seconds. The following independent testimonial from an orthodontist in Switzerland comments on the usability and benefits of the technology in clinical practice: The fastest tracing in the world? The results of these studies will be presented in September 2018 at the 6th MICCAI Workshop on Computational Methods and Clinical Applications in Musculoskeletal Imaging (MICCAI-MSKI2018), Granada, Spain. The papers will be made available on the BoneFinder® website following the event. BoneFinder® version v1.3.0 has been released and is now available from www.click2go.umip.com/i/software/Bonefinder.html. The US patent for the underlying BoneFinder®-technology, RFRV-CLM, has now been granted. BoneFinder® is now a registered trademark within the European Union. The BoneFinder® team has been awarded £236,000 by the Medical Research Council UK to further develop the system for the analysis of the efficacy of knee replacement surgery. The BoneFinder® team in collaboration with the Universities of Bristol, Southampton, Aberdeen, Queensland and Cardiff University have been awarded £1.6m by the Wellcome Trust to study the role of size, shape and structure of bones and joints in explaining common musculoskeletal diseases, using data from the UK Biobank. BoneFinder® has been used in a study on analysing the shape and texture of the bones of the hip for fracture discrimination. The results of this study will be presented in September 2017 at the Annual Meeting of the American Society for Bone and Mineral Research (ASBMR 2017), Denver, USA. The BoneFinder® technology has been advanced such that an existing system can be tuned to a new dataset with different properties. The results of this study will be presented in September 2017 at the 20th International Conference on Medical Image Computing and Computer Assisted Intervention (MICCAI 2017), Quebec City, Quebec, Canada. The paper will be made available on the BoneFinder® website following the event. BoneFinder® has been used in a study on predicting the onset of hip osteoarthritis. The results of this study will be orally presented in April 2017 at the 2017 Osteoarthritis Research Society International (OARSI) World Congress, Las Vegas, USA. BoneFinder® has been applied to study the shape of the mandibular condyles. The results of this study will be orally presented in November 2016 at the 1st Annual Congress of Association of Oral and Maxillofacial Surgeons of India (AOMSI 2016), Gujarat, India. A peer-reviewed journal paper on a fully automatic BoneFinder® system to detect cephalometric landmarks and its application to the classification of skeletal malformations has been published in Nature Scientific Reports. The paper is available via open access. The BoneFinder® team in collaboration with the University of Liverpool have been awarded £278,000 by Arthritis Research UK to further develop the system to help investigate the best surgical treatments for hip diseases in childhood. BoneFinder® version v1.2.0 has been released and is now available from www.click2go.umip.com/i/software/Bonefinder.html. Version v1.2.0 comes with exciting new features such as functionality to automatically generate an image list for easy navigation through as set of images as well as functionality to build Statistical Shape Models from within BoneFinder®. The patent for the underlying BoneFinder®-technology, RFRV-CLM, has now been granted for the United Kingdom, Germany and France. BoneFinder® has been applied to study radiographic knee shape asymmetry. The results of this study will be presented in June 2016 at the International Workshop on Osteoarthritis Imaging (IWOAI) 2016, Oulu, Finland. There has also been more work on the underlying BoneFinder® technology and the results on multi-point regression voting will be presented in July 2016 at the International Conference On Medical Imaging Understanding and Analysis (MIUA) 2016, Loughborough, UK. The abstract/paper will be made available on the BoneFinder® website following the events. A peer-reviewed journal paper on the cephalometric performance of BoneFinder® has been published in Medical Image Analysis. The paper is available via open access. The BoneFinder® website now contains additional performance results. The new BoneFinder® website is now online. BoneFinder® has been featured in the Medical Research Council Outputs, Outcomes and Impact of MRC Research 2014/15 report (Section 2.3 Development of products and intellectual property). 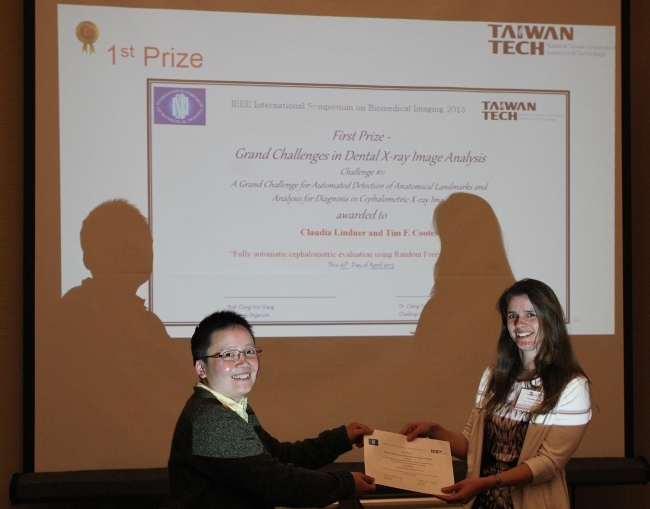 BoneFinder® has been awarded the first prize in the Grand Challenge on Automatic Detection of Anatomical Landmarks in Cephalometric X-Rays (Workshop at ISBI 2015). C. Lindner and T.F. Cootes. Fully Automatic Cephalometric Evaluation using Random Forest Regression-Voting. Proceedings of the IEEE International Symposium on Biomedical Imaging (ISBI) 2015 – Grand Challenges in Dental X-ray Image Analysis – Automated Detection and Analysis for Diagnosis in Cephalometric X-ray Image, 2015. The BoneFinder® team has been awarded £300,000 by the Engineering and Physical Sciences Research Council UK to further develop the system.